Vascular calcification is a frequent finding in peripheral arterial disease and remains an additional challenge to endovascular treatment in both recanalization and durability of interventions. The lack of standardization in the classification of peripheral artery calcification has led to a defective characterization of the performance of endovascular devices in the subgroup of calcified lesions of the femoropopliteal sector. 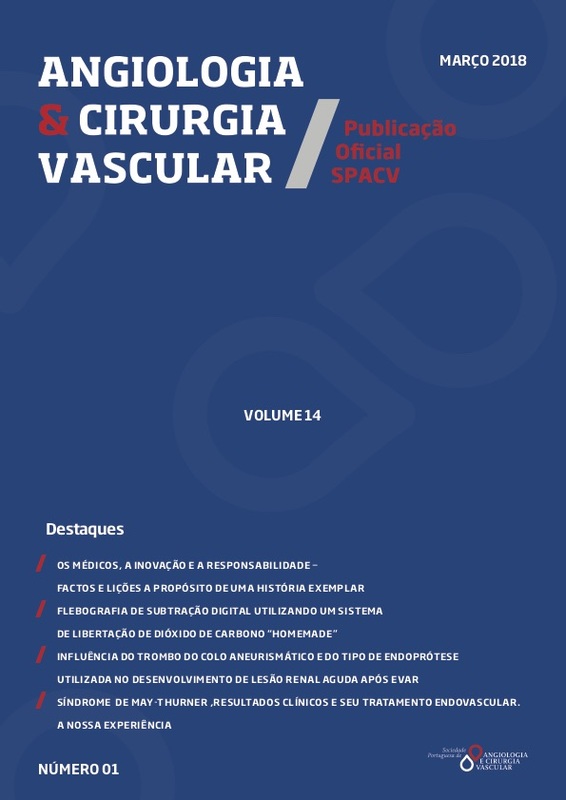 The objective of this review is to make a survey of the available evidence regarding the current options in the endovascular treatment of highly calcified lesions of the femoropopliteal sector. 1. Bausback Y, Botsios S, Flux J, Werner M, Schuster J, Aithal J, et al. long-term results. J Endovasc Ther. 2011;18:13-21.
femoral artery occlusions. J Endovasc Ther. 2001;8:156-66. 4. Okuno S, Iida O, Shiraki T, Fujita M, Masuda M, Okamoto S, et al. Intervention. Eur J Vasc Endovasc Surg. 2015;50:487-93. Arterial Disease (TASC II). J Vasc Surg. 2007;45 Suppl S:S5-67. of coronary artery disease. EuroIntervention. 2005;1:219-27.
prevalence, mechanism, detection, and clinical implications. 10. Capek P, McLean GK, Berkowitz HD. Femoropopliteal angioplasty. Factors influencing long-term success. Circulation. 1991;83:I70-80. Calcium. J Endovasc Ther. 2015;22:727-33.
undergoing primary femoropopliteal nitinol stent implantation. of randomized controlled trials. J Endovasc Ther. 2012;19:585-95.
occlusive disease. J Vasc Surg. 2015;62:1201-9. 17. Garcia L, Jaff MR, Metzger C, Sedillo G, Pershad A, Zidar F, et al. Failure Analysis. J Endovasc Ther. 2016;23:433-41.
registry. J Endovasc Ther. 2011;18:745-52. 22. Duda SH, Bosiers M, Lammer J, Scheinert D, Zeller T, Oliva V, et al. results from the SIROCCO trial. J Endovasc Ther. 2006;13:701-10. 23. Dake MD, Ansel GM, Jaff MR, Ohki T, Saxon RR, Smouse HB, et al. Zilver PTX randomized study results. Circ Cardiovasc Interv. 24. Dake MD, Ansel GM, Jaff MR, Ohki T, Saxon RR, Smouse HB, et al. Randomized Trial. Circulation. 2016;133:1472-83; discussion 83. 25. Muller-Hulsbeck S, Keirse K, Zeller T, Schroe H, Diaz-Cartelle J. -up. Cardiovasc Intervent Radiol. 2017;40:1832-8.
comparative study with claudicants. Eur J Vasc Endovasc Surg. with the Viabahn endoprosthesis. Cardiovasc Revasc Med. and an Analysis of Factors Predicting Failure. J Endovasc Ther. 29. Geraghty PJ, Mewissen MW, Jaff MR, Ansel GM, Investigators V.
femoral artery occlusive disease. J Vasc Surg. 2013;58:386-95 e4. trial. Cardiovasc Intervent Radiol. 2015;38:25-32. Atherectomy for Femoral Artery Disease (ISAR-STATH). Circulation.